Eating is a very dynamic experience. There are obvious advantages and disadvantages of certain foods, but some have been shown to have quite bizarre side effects and histories, often having nothing to do with nutrition. For many of us, eating is more than a body requirement; it is a time of enjoyment and gathering with friends and family. Make your food selections even more fun by learning some interesting facts about popular foods. We all know that many people can have serious allergic reactions to peanuts. However, their power can be brought to a whole new, in this case, nuclear, level. Apparently dynamite contains nitroglycerine, which is made of glycerol. Glycerol is a key component of peanut oil. How do we make peanut oil? I think you see where I’m going with this. 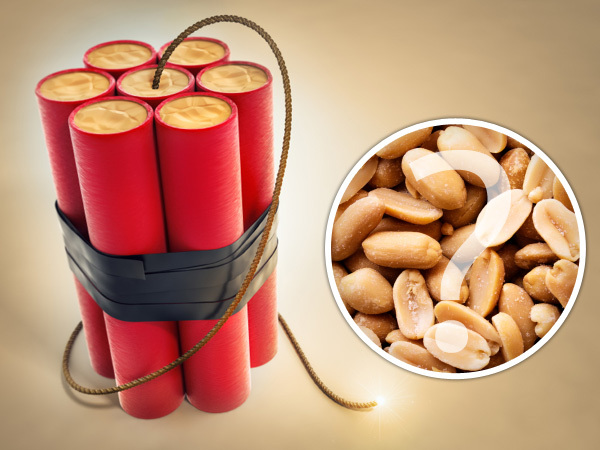 To those with an allergy to peanuts, there’s one more reason to avoid dynamite. Many people swear that if they consume apple juice late at night, they have extremely vivid, lucid dreams. However, the science behind this is a little shaky. According to WebMD, eating anything late at night will increase metabolism and stimulate the brain to be more active, resulting in more animated dreams. So why apple juice? It is possible that the apple juice dream phenomenon is merely the epitome of the placebo effect. The Food and Drug Administration allows a certain amount of grossness to happen to your food before they will deem it unsafe. Processing food is complicated, and if the FDA were too strict, too much food would be labeled unacceptable. Unfortunately, this knowledge doesn’t make our food any more appealing. It is rumored that the average chocolate bar contains approximately eight spider legs. Beware of crawling Butterfingers. The science behind this one is a little more straightforward. Regular consumption of oysters is known to increase dopamine levels, which boosts libido in both men and women. Dr. Nicholas Perricone explains that “oysters are extremely rich in zinc, essential for testosterone production and the maintenance of healthy sperm.” Looks like a seafood dinner for two may be more romantic than anticipated. Who doesn’t love kiwi fruit? It is sweet, small and nutritious. Oddly, much of this fruit went to waste in ancient times, because people were turned off by the brown covering. It theoretically took years for people to finally break open the fruit and discover its appealing color and taste. Not only are kiwis high in vitamin E, folate and potassium, but they teach us to never judge a book by its cover. Studies discussed in Medical News Today suggest that drinking two to seven glasses of wine per week may reduce the risk of depression and protect against heart disease. Red wine has also proven to contain anti-aging properties, protect the brain from stroke damage and even improve lung function. Although this is great news, it is important to keep in mind that these benefits are only in effect with moderate wine consumption. Coconut water is known to be miraculously hydrating, but did you know it was once used as blood plasma? In an emergency situation in the Solomon Islands, a doctor chose to infuse a patient with coconut water because of a shortage in IV saline solution. The most shocking part? It was a success! The rationale behind this use is that coconut water is sterile and an optimum pH to use as a supplement for blood plasma. However, it should be noted that the electrolyte composition in coconut water prevents it from being used regularly. There is a lot more than meets the eye when it comes to eating. As if food weren’t interesting to begin with, we can all be even more fascinated now. The PLAN: Can healthy foods be bad for you?